Most professional services firms will tell you what they are, but at MNP, we’re most proud of what we’re not. MNP is not a firm with limits. Entrepreneurial in nature, your insight and ideas, the kind that has helped us to become one of the fastest growing firms in Canada, are welcomed, listened to and acted on. We reward results and support the direction you want to take your career. MNP is not a firm with empty promises. Our definition of balanced lifestyle means fostering an environment that lets you thrive at work and make the most of your life outside the office. Ultimately, it’s what we’re ‘not’ that we’re most proud of, and we’re certain you’ll value this most as part of our team. Join the momentum at MNP, as we are seeking a Controller for our growing Aboriginal Services team in our Courtenay location. Committed to preserving Aboriginal traditions and positioning them for success, MNP is a leading national accounting, tax and business consulting firm to Canada’s Aboriginal communities. With more than 250 Aboriginal clients across the country and 70 team members dedicated to this sector, no other firm has invested as much time and resources into serving the unique needs of Aboriginal communities. MNP encourages a balanced lifestyle and offers benefits that suit the way our team members work and play! In addition to a competitive salary, our total rewards package includes paid personal days, wellness program initiatives, health and dental benefits, a group pension plan with matching contribution, firm-sponsored social events, and professional development assistance. 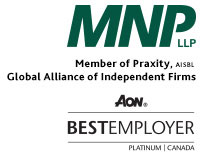 MNP proudly serves and responds to the needs of our clients in the public, private and not-for-profit sectors. Through partner-led engagements, we provide a collaborative, cost-effective approach to doing business, with innovative strategies to help organizations succeed across the country and around the world.